They obviously deserve each other. Last Sunday’s Times Book Review announced the publication of another book by the prolific Paul Goldberger, a former architecture critic for the newspaper. His subject: Frank Gehry. Probably the world’s most honored architect, and the most recognizable name among non architects, Gehry isn’t really Gehry. He’s Goldberg. The new biography announces that Frank Goldberg elected to change his name because, planning to become famous, he wanted something a bit more distinctive. With typical aplomb he constructed his new name from the old. Goldberger appreciates that kind of chutspah: he has made a career of jumping on opportunities to increase his own brand recognition. Though he didn’t change his name to get into Yale, he cozied up to powerful New Yorkers during his years at the New York Times and is now a regular A-lister in the Hamptons and on Park Avenue. He now writes for Vanity Fair, a perfect fit for his ambitions. Though I haven’t yet read the book, the reviewer (author of a biography of Le Corbusier) finds its analysis tepid at best. That’s not the typical description of Gehry’s work. What interests Paul G. is that Frank G. was a clever public relations maven who crafted his fame by cultivating friendships in the art world and being in Los Angeles, among movie people. In many ways Mr. Goldberg became the prototypical “Starchitect,” today’s paltry substitute for a genius like LeCorbusier. Mr. Goldberger has his sights on “Starjournalist.” H. L. Mencken would not be impressed. 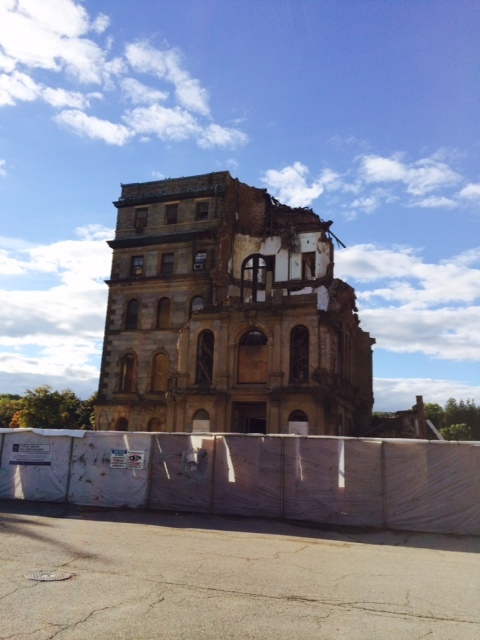 The attached photo, by my colleague Barry Thomson, shows the remaining portion of Greystone Hospital, one of the most significant mental hospitals ever built. The state of New Jersey, under Chris Christie, failed in its duty to preserve a national landmark.